Beatnik Turtle Turns 20! TheSongOfTheDay.com Turns 10! The band is celebrating 2 things this January 1, 2017. First, Beatnik Turtle turns 20 years old January 1st. Second, the band is celebrating the 10th anniversary of TheSongOfTheDay.com. 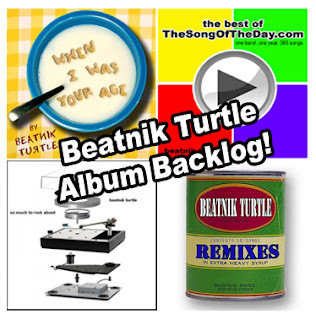 That's right -- 10 years ago tonight at midnight Beatnik Turtle launched its boldest project to date: releasing 365 songs, one song for each day of 2007. The site is still alive and well. It's been kickin' tunes weekly since January 1, 2008. And, we're leaving the site "as is" so it's an artifact to the world wide web circa the mid-2000s. So, if you visit it, prepare to step back in time. Before iPhones, VR, AI assistants, self-driving cars, and Uber. Happy New Year! Here's to a music-filled 2017! The Best of The Song of the Day -- Completed! Over 7 years in the making, The Best Of The Song Of The Day is completed and on it's way to digital stores and streaming services everywhere. With the band back in the US (a couple of them went to Ireland, remember? ), they regrouped to revisit, remix, and remaster 44 of the most popular and best geek-rock songs from the band's TheSongOfTheDay.com project. That's 12%of a year’s worth of music, man. Beatnik Turtle, dubbed “remarkably prolific and fiercely independent rock group” by NPR, has created 19 albums and produced countless compositions for TV, commercials, films, podcasts, and theater productions (including Disney, Viacom, and Chicago’s world-famous Second City). But in 2007, they decided to take on a major creative challenge: release one original song for every day of the year. They succeeded, and the result was 365 songs totaling 14 hours 57 minutes and 22 seconds of music that crossed genres, topics, and styles, all based on their horn-powered geek rock sound. Beyond the hundreds of thousands of song plays the project generated from it’s TheSongOfTheDay.com site, many of their songs found lives of their own outside of the project. For example, their song and video for “Star Wars (A Film Like No Other)” got played in heavy rotation at StarWars.com and AtomFilms, culminating in SpikeTV highlighting and broadcasting the music video in 2008. Other songs were licensed to documentaries and other creative works, featured on radio stations, videos, and played on podcasts all over the world. After their massive project finished on December 31st of 2007, ending nearly two years of constant in-studio work and songwriting sessions, Beatnik Turtle decided to take some time off -- a month. Once February of 2008 hit, they were right back at it in the studio recording what was to become their award-winning celtic rock album of Irish pub songs, Sham Rock. Since 2008, the band continued to produce. Beyond writing, recording, and releasing new, original music via the Web, Beatnik Turtle took on many other projects, including releasing three music business books with major publishers (Macmillan, Random House) -- including the second edition of The Indie Band Survival Guide (Remixed and Remastered) -- traveling to Europe to perform, composing commissioned theme songs for TV shows, and, of course, writing even more music. With The Best Of The Song Of The Day, the band wanted to take the time to revisit fan favorites from the project and give the music the studio time and mastering the very best songs deserved. In this album, you’ll find 44 fan and band favorites. But it’s not just a remastered album -- Beatnik Turtle went back to the studio to revisit the songs, energize them with new vocals, additional instrumentation, and other parts that they always wanted to include but didn’t have time to during the brutal schedule the project demanded. This album allowed them the freedom to go back to the masters and “put on the polish” that some of top and most popular songs deserved. The result is The Best Of The Song Of The Day, containing songs about machines trying to take over the world, odes to coffee and going commando, a nine part rock opera about ordering a pizza, and much, much more. Randy, our band's sax player, recently got interviewed by The Intrepid Songwriter Show and in part two talks about our band's songwriting approach, TheSongOfTheDay.com project, and more. New Album Out! "When I Was Your Age"
We're proud to say our latest album, "When I Was Your Age" is officially out in finer digital stores near you (iTunes, CDBaby, and more). "When I Was Your Age" is an entire album of upbeat Beatnik Turtle geek-rock that looks back to when we were kids -- back when phones were attached to walls and video games were nothing but dots and lines. You know, songs about eating cereal, going to school, getting bullied, and wondering "are we there yet?". Definitely one of the best Beatnik Turtle albums to date and worth getting for the kid in all of us! 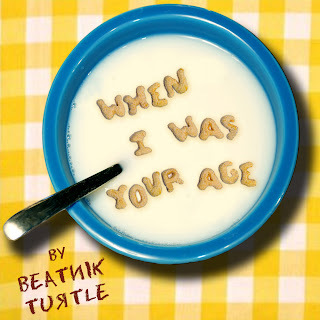 We're proud to say "When I Was Your Age" will be made available for digital distribution ASAP. ASAP? What does that mean? Well, it means we found the time to finally roll up our sleeves and finish all the detailed work up. Our fine album about looking back to when we were kids is now in the hands of "the iTunes" and other fine digital distributors. Yep, given some cool turn of events -- most notably two of the band members temporarily moving to Ireland and the writing of the second edition of The Indie Band Survival Guide (hitting book stores Sept 4, 2012!) -- it's taken longer than we thought to get some of our backlog of albums out. But that's past us now. "When I Was Your Age" will be available soon. It's an excellent, thematic album with incredible, melodic songs that sound incredible thanks to the additional magic our mix-master, Tom Roper, lovingly provided. And it's coming soon to a digital store near you! A completely new music-related writing project just knocked two of us in the band upside the head (Randy and me, Jason). So, he and I are focusing all our energies that way so we can “give it our all” like we did with our IndieGuide.com site and our books, The Indie Band Survival Guide and The DIY Music Manual. If you're a musician who follows us, you may have noticed that we’ve put the IndieGuide.com blog, some of our social media (Twitter, Facebook, Google +, etc. ), and the free How-To’s on “pause” for the time being. That’s because we’re changing things up going-forward as we share our research from this project. Of course, we’d like to hear your feedback as well as we work to elicit ideas, get your success stories, thoughts, and ideas. A big thank you to all those who have written to us with their comments, suggestions, and compliments regarding the book. We definitely appreciate it -- it keeps us motivated and it’s the very reason why we’re rolling up our sleeves now and diving into research and writing. Oh, and in between writing, we'll continue to master and prepare the above albums. There's a lot of us in this band, you know.